Once you have installed the Linear B Font, you can then proceed to type anything you like in Linear B, by following these steps in order. (b) Next, you should increase the size of your Linear B font 2 points up from your default font size in (a). Thus, if you default font size is 12 points, you should set the Linear B font to 14 points. You may also need to set the Linear B font to BOLD if it does not appear clearly enough to your satisfaction. This is up to you. If you type A S D F G, you will automatically get DA DE DI DO DU. Try it! If you type a s d f g, you will automatically get TA TE TI TO TU. If you type Z X C V B, you will automatically get NA NE NI NO NU. If you type z x c v b, you will automatically get SA SE SI SO SU. NOTE the mnemonics, DATA & NASA, for the syllabogram series DATA = DA... + TA... and NASA for the syllabogram series NASA = NA... + SA... Think about it for a second or two, and you will get it. From then on in, it will be a cinch for you to  type DA... from A... & TA... from a... (DATA) + NA... from Z & SA from z... (NASA). Anyway, it is for me. If you don ’t like using mnemonics (memory reminders, the string on an elephant ’s trunk), you can just skip this part. The only exception to this is the series: q w e r t (lower-case LC), which gives you the 5 vowels in order: a e i o u. SHIFT 1 2 3 4 5 = ! @ # $ % yield the homophones: ha nwa pu2 rai riya. (A) You MUST follow these steps after you have finished typing text in Linear B. (a) SAVE your document immediately in .doc or .docx format! (b) SWITCH to your default font (e.g. Times New Roman or Georgia) and reduce your font size by 2 points (also remove BOLD if you used BOLD to type in Linear B). (c) You may now continue typing in your default font. If Linear B still appears, and your default font does not, you have incorrectly followed this procedure. (b) SWITCH to the Linear B font and increase your font size by 2 points (also add BOLD if you want your Linear B text to stand out). 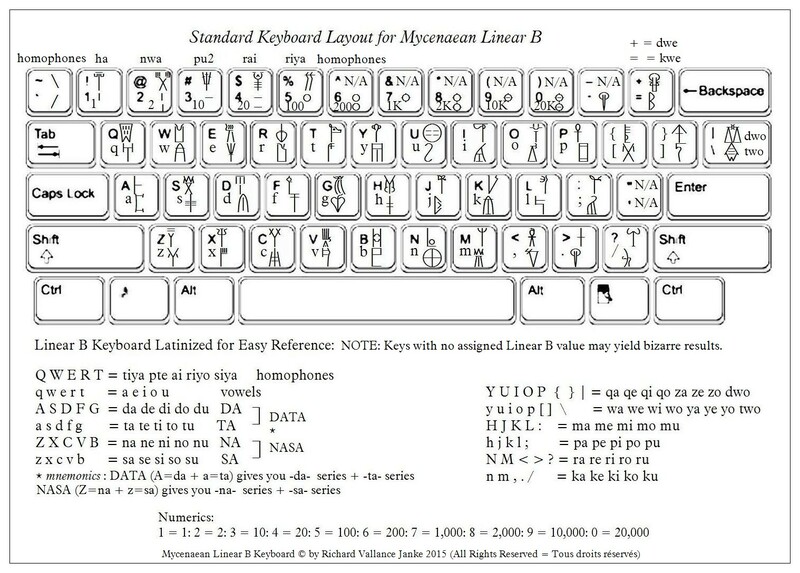 (c) You may now continue typing in Linear B. If your default font still appears, but Linear B does not, you have incorrectly followed this procedure. Simply alternate from (A) to (B) to switch back and from your default font & Linear B. DO NOT OMIT ANY STEPS! IT IS IMPOSSIBLE TO TYPE LOGOGRAMS & IDEOGRAMS USING THE LINEAR B FONT. Oh, and don’ t forget to print out this template of the Linear B font, laminate it in plastic and pin it to the wall above your computer for quick reference! I shall illustrate how to insert these in your Linear B text in the next post. Thanks Richard, I have enlarged the Keyboard and will now Laminate it. !! Great! Now just ask your tecchie geek friend to install the font and you are off to the races! Can’t wait to learn how to do this.